Win 2000 Realmgem on Halloween in Magerealm! 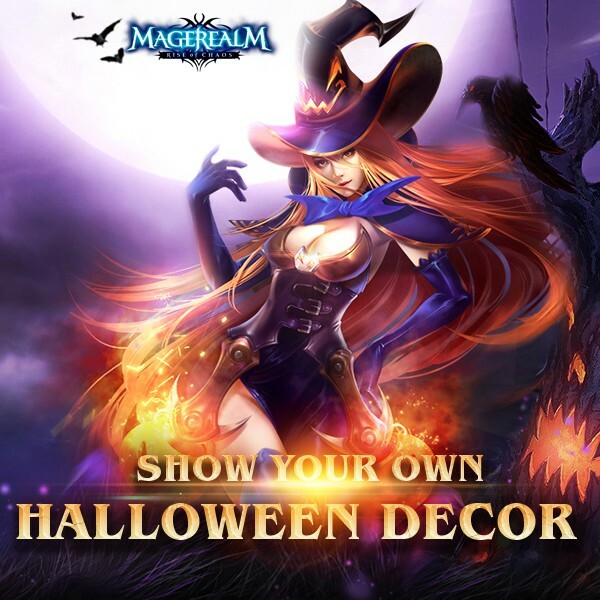 Magerealm, our hit 3D MMORPG browser game, is excited to announce the Halloween Fan Page event! Halloween is coming, do you have any Halloween decoration in your home? Participate in the contest by posting YOUR OWN PHOTOS about Halloween on our Fan Page before Oct.31st, 2016. There will be a unique chance to win 2000 Realmgem FOR FREE! By Nov.1st, 2016, our staff will pick out the best 5 photos and start a poll on Fan Page. The photo with most likes in 3 days will be the winner, but there will be rewards for all participants! Don’t miss out on this huge Halloween event! Be sure to check the official Magerealm Facebook fanpage and forums for the latest news! If you have not tried Magerealm yet, now is a great time to start your adventure in this epic action MMORPG!